AS WORLD CUP FINALS GO, the one played out between Argentina and West Germany in 1986 would take some beating for drama. The game seemed won, before being cast into huge doubt, and then a late winner decided the issue in favour of the South American passion play. Although he didn’t score in the final, the tournament will, for a variety of reasons, be largely remembered with Diego Maradona as its greatest star. That said, even the great Argentine icon would surely concur that others too warranted great credit and acclaim. Standing alongside giants can often mean that a shadow falls across others, obscuring their brightness, but they too have a tale to tell that can shed light on events. Jorge Luis Burruchaga is one of those oft-perceived to be lesser lights, but as the scorer of the late goal that ascended La Albiceleste to the heavens, his is a story crying out to be told. Every hero had his sidekick. Anyone that achieves great things has the person that perhaps sacrifices their own prestige, their own potential for glory and fame, for the greater good. They offer a nod of acceptance to the fact that the other person may have greater powers, and selflessly does their bit to ensure that ‘the talent’ has maximum opportunity to deliver. Batman had Robin. Morecambe had Wise. Even Don Quixote had Sancho Panza. 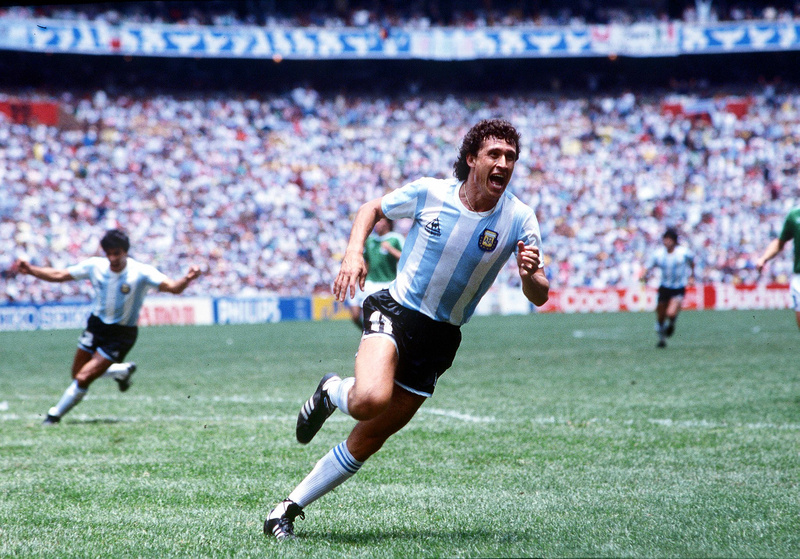 In the World Cup of 1986, Jorge Burruchaga was that man for Maradona. A truly outstanding player in his own right, he took on the role as best supporting actor to Maradona’s Oscar-winning superstar performances. Maradona was box office; Burruchaga was box-to-box. After 84 minutes of a dramatic game at the Estadio Azteca in Mexico City on 29 June 1986, though, the fates cast their eyes with grace on Burru, and rewarded him with the goal that won the World Cup. It all worked out well for Carlos Bilardo’s team. They eased through group one, topping the table. They comfortably beat both Bulgaria and South Korea and drew with group runners-up, Italy. A single-goal victory over Uruguay in the last 16, thanks to a strike by Pedro Pasculli, saw them into the last eight, where they were to face England. A handful of trouble and the feet of a genius would take them to the semi-finals. After playing every second of every game up to this stage, Burruchaga had shown himself to be indispensable. Pitched into the middle of the midfield, he was the player that best understood the mercurial Maradona. They fitted together like a hand in a glove. Two goals to the good, and with just 15 minutes to play against England, Bilardo decided that he could withdraw Burruchaga and rest him for the next game. Without the mainspring in their watch, though, it’s no surprise that the Argentine play stalled, allowing England not only to score, but also to come so close to an equaliser. Time slowed to a crawl, but Argentina held on. It was a mistake the coach wouldn’t make again. After defeating England, Burruchaga recalled: “We thought we might be able to win the World Cup.” The last four match-up was against Belgium and it was another tale of Maradona ably assisted by the ever-present Burruchaga. Statistics show that Maradona touched the ball 98 times in that game – the most by any player in any game in the finals – and it was Burruchaga who supplied with most of the passes to his feet. He knew that, after England, the maestro was on fire and only needed to be given possession to win the game for his team. Maradona would net twice in a dozen second-half minutes to do just that. One of the goals was from a superb pass by Burrachaga, merely requiring his skipper to lift the ball over Jean-Marie Pfaff in the Belgium goal. Later, when talking to El Gráfico, the midfielder would sum up the feelings of the squad towards Maradona. “I have always said, ‘thank God Diego is Argentine’. 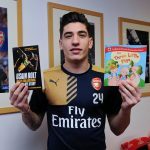 We always knew what he meant for us, although we should not forget we had an extraordinary team, that overcame tough times with the maturity needed to get over our problems and do whatever it took for the shirt. We all helped Diego become what he did. He was the ace of spades, but the team helped him a lot.” A certain, and clearly modest, Jorge Burruchaga helped him most of all. And so to the final. Burruchaga describes the journey to the Azteca as “short” but taken at an “ant’s pace” partly due to the crowds, but just as importantly because of the need to complete the ritual of good luck songs before arriving at the stadium. Bilardo had considered it likely that the Germans would deploy Lothar Matthäus to man-mark Maradona, making it then a 10 v 10 game that would offer them a greater chance of prevailing. It was hardly a novel tactic for the Germans in such important games. Franz Beckenbauer, now coach of the team, had been deployed in a similar role to negate Bobby Charlton back in 1970, and eight years later, Berti Vogts was given the unenviable task of shadowing Johan Cruyff. If that scenario happened, as indeed was the case, Bilardo had emphasised to Burruchaga that he “would have to own the midfield”, insisting that he should keep looking towards the bench for signals as to what to do. If the German ploy had worked, with the influence of the skipper partially eliminated by Matthäus, it would fall to Burruchaga to be the man to break the shackles. In front of Nery Pumpido, La Albiceleste had a back three of José Luis Brown, José Luis Cuciuffo and Óscar Ruggeri, with Sergio Batista as the holding midfielder. Wing-backs Ricardo Giusti and Julio Olarticoechea provided the width on the right and left respectively, with Héctor Enrique and Burruchaga looking to supply Maradona and Jorge Valdano. As predicted by the coach, it would fall to the Nantes player to prod and prompt the front two in attack. 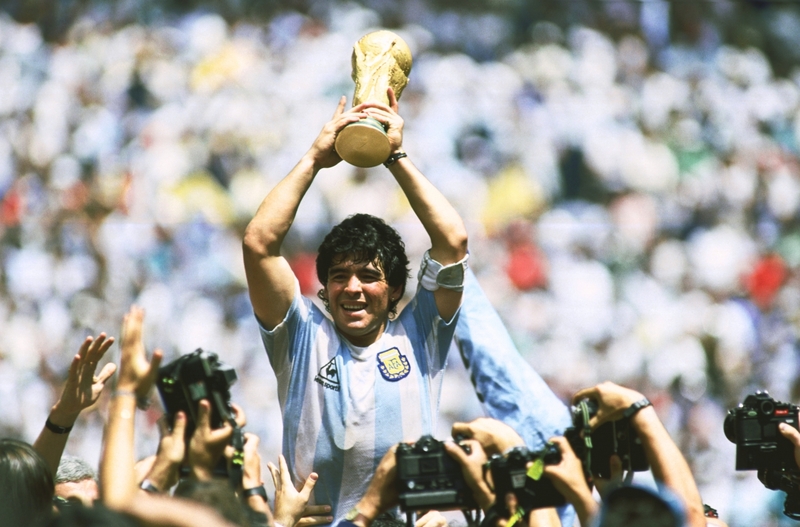 Of course, Maradona was the main man. Credit goes to Bilardo for deploying him in an advanced position where his genius could be most hurtful to the opposition. Credit too goes to Maradona himself. Kicked from metaphorical pillar-to-post, he even took to wearing shin pads on the back of his calves to protect his muscles, such was the battering he took from those who were inadequately gifted to deal with him through legitimate pursuits. There was, though, another man. Low profile, but ubiquitous. According to reports, Maradona and Barruchaga were never friends – at least not off the pitch. On it, with the ball in play, they were harmony personified. Deployed alongside the captain, Burruchaga was the player who made Maradona shine the brightest; the right-hand man, the player whose thought pattern could mesh with the greatest player of the era. To exact the maximum benefit from having the number one player in the world in their team, Argentina needed someone to drive Maradona on. It was a role eminently suited to Burruchaga, and he performed it with almost flawless efficiency. In a team consisting of players eminently capable of carrying out assigned roles within the coach’s game plan, Burruchaga was one of the few more complete players. As well as fulfilling his requirements to move play forwards, he would mark opponents, tackle and cover when the need arose, and was one of the few who had the technical ability to play Maradona’s game, link up with him, and spot and seize the rare openings created. 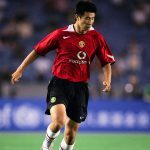 He was also far and away the player who most linked with the incomparable number 10. Add in his tireless energy and there’s the very model of the ideal midfielder. This was Argentina’s third final. They had been defeated by Uruguay in the first World Cup back in 1930, and then defeated Holland on home territory in 1978. Now, under the hot Mexican sun, they were looking for their second title. Early on, the link between Maradona and Burruchaga nearly brought dividends, but not in an expected way. An astute run to the near post by the Nantes midfielder saw him glance on a Maradona corner, but the ball was scrambled clear. The Germans had attacking intentions of their own. The muscular Hans-Peter Briegel powered his way towards the edge of the Argentina box, before throwing himself to the floor in the sort of swallow-dive that should have brought only ridicule. The referee, Romualdo Arppi Filho, was apparently taken in by the theatrics, however, and awarded a free-kick. Any concerns the Argentines had ahead of the game, knowing it would be officiated by a Brazilian, were brought to the surface. Justice was served, however, when Andreas Brehme’s shot was easily saved by Pumpido in the Argentina goal. 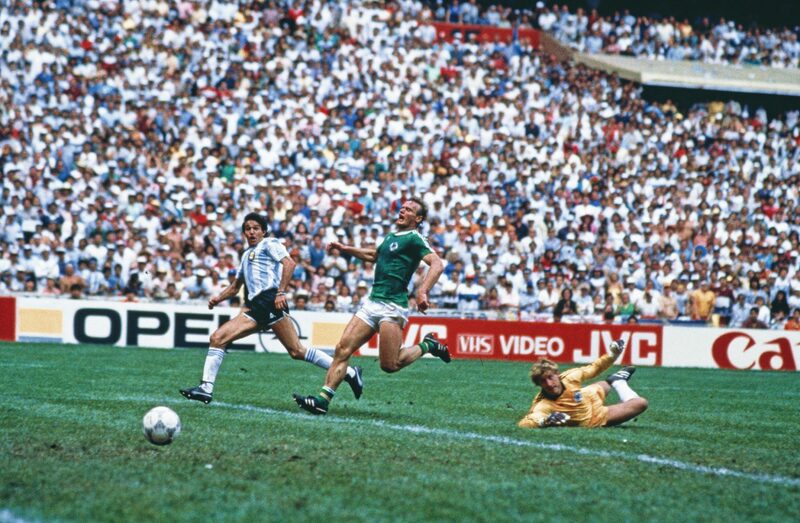 At the other end of the pitch, in a reversal of the normal roles, Maradona sought to play a through ball to Burruchaga, but the run was halted by Brehme’s interception of the pass when the Argentine was in the clear. Not long later, though, just midway through the first period, Argentina scored – and Burruchaga was intimately involved. A clumsy challenge by Matthäus near the corner flag on the Argentine right flank conceded a free-kick. Burruchaga arrowed the ball into the area, deceiving German goalkeeper Harald Schumacher and finding the head of defender José Luis Brown, who nodded into the empty net. Burruchaga had crafted the opening for the goal that saw Argentina take the lead. 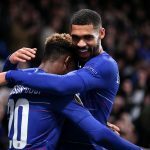 Brown would later thank the midfielder for “the perfect delivery.” As the players broke from the celebrating huddle, Brown kissed the ball before hugging the man who provided the cross. Argentina were now in full flow. Maradona and Burruchaga again combined with some intricate interplay before the latter was tumbled to the floor on the edge of the box. Maradona’s effort was tame, however, and easily collected by Schumacher. At the break, the lead remained intact. It hadn’t been an enthralling period, with too many niggly fouls breaking up the play, but Argentina were satisfied, and better still was to come for La Albiceleste. The second half opened brightly and, within 10 minutes, Argentina had doubled their lead. Maradona led the charge, receiving the ball just inside his own half before pivoting and playing it into the path of Héctor Enrique, who galloped forward before playing a ball that saw Valdano in on the German goal. The Real Madrid striker was coolness personified as he advanced before opening his body to slide the ball home. Two goals clear and it seemed like the trophy was bound for Buenos Aires. Perhaps inevitably, there was a period when the team eased up. For whatever reasons, as the game wore on the Germans became stronger and began to look dangerous. As they pressed forward, though, the danger of a third Argentina goal on the break was real. A header from Valdano nearly put the matter beyond doubt, but it flew wide. Still the Germans strove for a breakthrough that would at least give them a fingerhold on the contest. Beckenbauer had sent on Rudi Völler for Klaus Allofs just into the second period and, five minutes after Valdano’s goal, he played his second card by replacing Felix Magath with Dieter Hoeneß. With 15 minutes remaining, he got the first instalment of his reward. A Brehme corner from the left was flicked on by Völler and skipper Karl-Heinz Rummenigge jabbed out a leg to stab the ball home from six yards. Where there had been confidence, suddenly concern raged in the Argentina ranks, and worse was to follow. Just seven minutes later, another Brehme corner was met by Thomas Berthold who headed back across goal for Völler to nod home. Argentina had looked like lifting the World Cup for the best part of an hour, and in just over half-a-dozen minutes, it had been thrown from their hands. What telepathy, what instinct or unspoken understanding was passed in that look, is for others to contemplate, but just a few minutes later, Burruchaga and Maradona combined, and that “we” put the trophy back into South American hands. It‘s an intriguing insight into what many may have looked like a simple piece of play, but illustrates the value of the relationship between the genius that is Maradona and his sidekick. Those are magical words, especially if you’re the player who scored the winning goal.